Charles Ball. Slavery in the United States: A Narrative of the Life and Adventures of Charles Ball, a Black Man, Who Lived Forty Years in Maryland, South Carolina and Georgia, as a Slave Under Various Masters, and was One Year in the Navy with Commodore Barney, During the Late War. 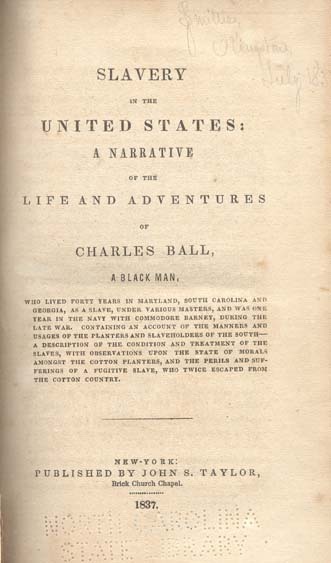 Slavery in the United States: A Narrative of the Life and Adventures of Charles Ball, a Black Man, Who Lived Forty Years in Maryland, South Carolina and Georgia, as a Slave Under Various Masters, and was One Year in the Navy with Commodore Barney, During the Late War. New York: Published by John S. Taylor, 1837.